Our minister, Kimberly Quinn Johnson joined us in August 2015. Before joining us, Kimberly served as Intern Minister at 4th Universalist Society of New York, where among other things—she led the small group ministry program and a monthly Jazz Vespers Service. She is a recent graduate of Meadville Lombard Theological School. At Meadville Lombard, Kimberly was a President’s Scholar and was awarded the Faculty Award for Religious Leadership. 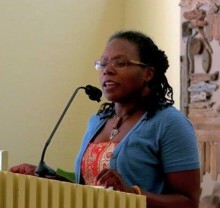 In our larger UU World, Kimberly is a program leader with the UU College of Social Justice, which offers experiential learning journeys and social justice training designed to help Unitarian Universalists deepen and sustain the work of justice in their congregations and communities. She specializes in youth programs. She also currently teaches Women’s and Gender Studies at New Jersey City University. Before ministry, Kimberly worked as a union organizer with the United Auto Workers. Kimberly is currently serving as a member of the Board of Trustees for the Metro NY District. To stay connected to the world, Kimberly blogs about race and culture. To stay connected to her spirit, Kimberly practices yoga and meditation. And in her copious spare time, she reads, and mentally plans for her chance at The Amazing Race.